It’s difficult to walk around Dubai without being in constant awe of one’s surroundings. The modern city is nothing short of incredible. Built from the ground up within the last 40 years, a main argument it is using to win a World Expo bid in 2020, Dubai seems to boast the biggest and best in the world whether it’s fountains, skyscrapers or gold-plated flag poles. And when it comes to all things grand, the Dubai International Film Festival is no exception. Last year’s festival was taken over by Hollywood with the premiere of Mission: Impossible 4, a film complete with Tom Cruise scaling Dubai’s Burj Khalifa, the world’s tallest building. This year’s expertly run festival gave the indies room to breathe, focusing on the massive treasure trove of new talent from the Middle East, Africa, and beyond. There was no shortage of big-name pictures. The festival opened with Ang Lee’s latest, his 3D blockbuster Life of Pi. The film’s stars Suraj Sharma, Adil Hussain and Shivanthi Sainath walked the sparkling red carpet at the impressive Madinat Jumeriah Complex, where the majority of the festival took place. Other top billings included Michael Haneke’s intimate story of love in old age, Amour; Anvil helmer Sacha Gervasi’s Hitchcock; and a closing night gala with Wayne Blair’s Aboriginal musical comedy The Sapphires. But the true stars of the festival were the gems from recent Arab cinema. This year’s programming welcomed over 50 world premieres with upwards of 70 Arab cinema titles in total, films which tackled themes of war, revolution, and protest, alongside romantic comedies and movies for kids. Wadjda Actors Waad Mohammed and Abdullrahman Al Gohani. The centerpiece of the festival was Wadjda, the first feature film completely made in Saudi Arabia, which incredibly was made by a female filmmaker, Haifaa Al Mansour. Wadjda, played by Waad Mohammed, is a 10-year-old girl who challenges the conservative conventions of her country by aspiring to buy a green bicycle, although it’s forbidden for women to ride one. Wadjda dreams of racing her friend Abdullah, but also of finding happiness in a world where she is constantly told to conform against her own nature. It’s a metaphor for Al Mansour’s own five-year journey in getting the film made in her native country. The result is a pioneering achievement driven by storytelling of both historical and contemporary importance, as well as raw acting talent. This instant classic, not surprisingly, took top honors for its Middle Eastern premiere, taking both Muhr Arab Best Film and Best Actress awards. Movie attendance is up in Dubai. Karzan Kader’s Bekas tells the tale of two young Iraqi Kurds, orphaned and homeless, living under Saddam Hussein’s brutal regime in the early 1990s. They are inspired to find their way to America after sneaking into a screening of Superman. Unable to buy black-market passports with the money earned from shining shoes, or even a means of transportation, the brothers fail to get very far. When the elder brother, Dana, accidentally steps on a landmine, and fears his slightest movement will set it off, the brothers soon realize the only superheroes they’ll ever need are right in front of them. The film is intense, not only because the younger brother, Zana, shouts all of his lines rather than speaking them. Although the rhythm is flawed, it’s overall a must-see look into a side of Iraq that is often ignored. The film earned the Dubai Expo 2020 People’s Choice award, which it shared with French film Ernest et Celestine. Ziad Doueiri’s The Attack adapts the controversial novel by Algerian writer Yasmina Khadra. Ali Suliman plays a respected Palestinian surgeon working in Israel, whose wife’s sudden suicide bomb attack kills 17 people. What follows is a journey of grief and outrage as he struggles to uncover his wife’s motives. The film is hard-hitting throughout, with each scene bringing the audience further and further into the story. Doueiri masterfully explores almost unanswerable questions in this moving political thriller. On the lighter side, Rola Nashef’s Detroit Unleaded paints the portrait of one Lebanese American family tending a gas station in Detroit. Nashef accurately and playfully shows Detroit’s segregated communities, revealing one of the few settings where blacks and Arabs intermingle. The jokes could easily be clichés, but with Nashef’s natural humor and the film’s strong acting performances, there are several moments of comedic brilliance. The storytelling fails to register much emotional drive beyond a well-painted portrayal of a community, but the tender moments on screen mark Nashef as a director to watch. She’s currently working on a comedy about four Lebanese women trying to get married. 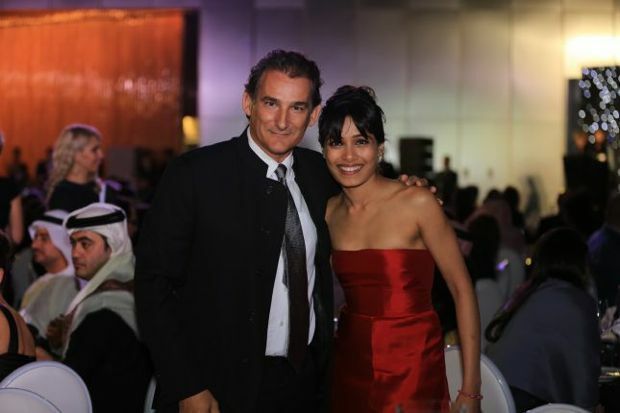 Freida Pinto with the man who just bid $18K on her dress for Oxfam. 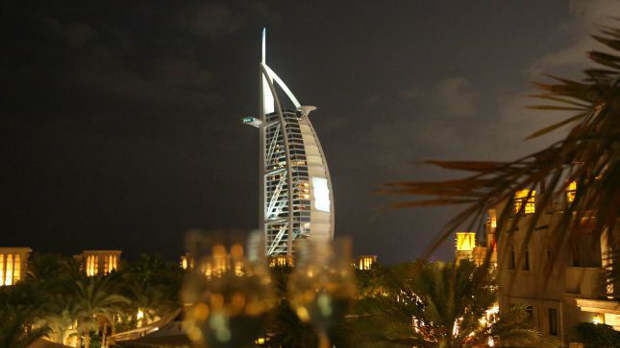 Of course it wouldn’t be Dubai without some outrageous parties. Oxfam and Dubai Cares brought the stars out to the Armani Hotel at Burj Khalifa to fundraise for clean water in schools in Tanzania. Egyptian actor Amr Waked, who was also awarded Muhr Arab Feature Best Actor for his starring role in the festival’s Winter of Discontent, about the recent Egyptian revolution, made a personal appeal to the donors that gathered. Colin Firth and Freida Pinto surprised the crowd by auctioning the clothes off their backs, helping to raise over half a million dollars in total. With the concurrent Dubai Film Market, the city is taking the lead in developing the film industry in the Gulf Region and bringing new Arab voices to the screen. The Dubai Filmmart offered buyers films at their fingertips with a digital screening system via Cinetech. And for the first time, sales agents with films playing were allowed to showcase up to three other films they represented, suggesting a bid to compete with other global film markets. 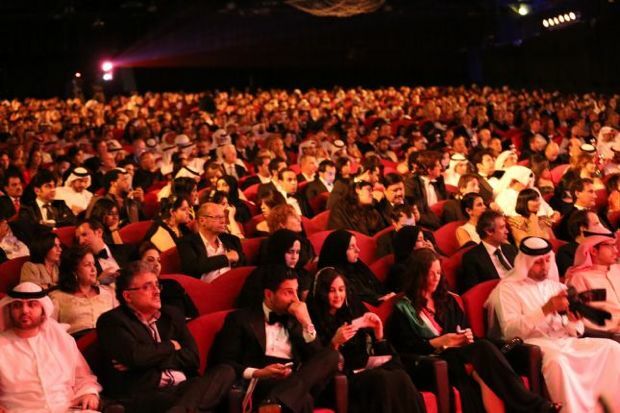 The Dubai Film Connection brought a feature film and co-production market to the festival, connecting Arab filmmakers with global industry professionals with the goal of increasing production in the region. 2013 marks the 10th anniversary of the Dubai International Film Festival, and it’s sure to be a year filled with some giant surprises at the road where Arab cinema and Hollywood meet.